Tired of the election rhetoric? Patrick Street Productions and Touchstone Theatre may very well have the cure with The Best Laid Plans: A Musical. The Best Laid Plans: A Musical is a political satire that even old stock Canadians will appreciate. A fun musical take on Canadian politics, this one gets my vote. 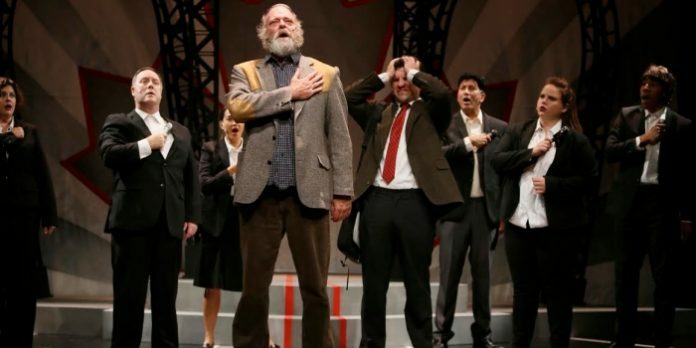 A musical adaptation of Terry Fallis’ 2008 Stephen Leacock Medal for Humour winning novel, The Best Laid Plans is a welcome respite from Canada’s longest election campaign since 1872. Cleverly skewering all sides of the political spectrum, this Vern Thiessen, Benjamin Elliott and Anton Lipovetsky penned musical takes careful aim at what makes our country’s politics so interesting, and often times inherently (and unintentionally) funny. Disillusioned and looking to escape the world of politics, Liberal speech writer Daniel Addison thinks he has found his way out by doing one final deed for his party: find a sacrificial candidate in a riding who has no possibility of winning against the popular Conservative incumbent. Of course, nothing in politics is ever as simple as it might seem, and Addison finds his crusty old candidate, Angus McLintock, may actually have a chance at being elected. While there are few surprises in Thiessen’s book as we watch McLintock rise from obscurity to take the Ottawa machine head-on, what is surprising is in the diverse and sometimes memorable music from Elliott and Lipovetsky. With a varied palette of styles, the music is elevated by insightful lyrics that takes on everything from Conservative “Family Values” to our “Binary World”, while even managing to win over our hearts with a beautiful ode to McLintock’s dead wife in “The Other Side”. 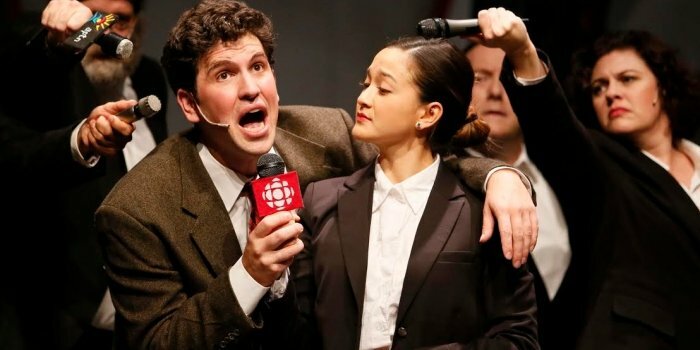 Nick Fontaine (left) plays the disillusioned political speech writer in the musical adaptation of Terry Fallis’ The Best Laid Plans. Photo by Tim Matheson. And even while the story sometimes dips its toes in the ridiculous, this cast stays true to Fallis’ satirical message, ensuring that is all ultimately believable. Keeping things grounded are terrific performances from both Nick Fontaine and Andrew Wheeler as Addison and McLintock respectively. Fontaine carries the show with skill, but no stranger to the political satire having played the Prime Minister in Proud, Wheeler is particularly good here, walking that fine line between the silly and the serious. His rendition of “The Other Side” is so heartfelt it was enough to bring tears. 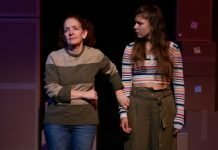 There are fine performances from the rest of this cast too, from Meaghan Chenosky as the love interest to a hilarious Patti Allan as Muriel Parkinson, the ensemble is as top notch as the tiny band led by musical director, Jonathan Monro. Hal Wesley Rogers and Steffanie Davis give us a smart take on their genderqueer characters, while Shannon Chan-Kent, Zahf Paroo, Gordon Roberts and Katey Wright bring life to their various characters. Roberts is particularly fearless in the role of the incumbent, Eric Cameron, who finds himself caught out in a scandal. Director Peter Jorgensen keeps everything moving along nicely through most of the first half, and even as that pace doesn’t quite sustain in the second, his use of Drew Facey’s clever set keeps things interesting. The Best Laid Plans based on the novel by Terry Fallis. Book by Vern Thiessen. Music and lyrics by Benjamin Elliott and Anton Lipovetsky. Musical direction by Jonathan Monro. A Patrick Street Productions and Touchstone Theatre co-production on stage at the York Theatre (639 Commercial Dr, Vancouver) until October 3. Visit http://thecultch.com for tickets and information.